Hold the Shift key, choose Edit | Advanced Preferences, and click the System tab to open this panel. The settings on this panel correlate Sketchpad’s behavior with your particular computer, allow you to edit Sketchpad’s color menu, and allow you to change all preferences back to their original values. Ideal medium speed: This value sets the approximate speed represented by a value of 1.0 in the Motion Controller, or “medium” speed for a Movement button. You should modify the speed only if your computer is consistently too fast or too slow for your tastes when animating objects at a speed of 1.0 in the Motion Controller. This value is “ideal” in the sense that Sketchpad attempts to reach it. If you’re animating a particularly complex sketch or have a slower computer, animations may be slower than this. Screen resolution: This value sets the correspondence between the pixels on your computer screen and real-world length units. The normal value is 96 pixels/inch (37.795 pix/cm) for Windows computers and 72 pixels/inch (28.346 pix/cm) for Macintosh. You should modify this value only if it’s absolutely necessary that on-screen distances match Sketchpad’s measured distances. Changing this value may result in discrepancies when you paste Sketchpad pictures into other applications, which assume your screen resolution is fixed at 96 or 72 pixels/inch. 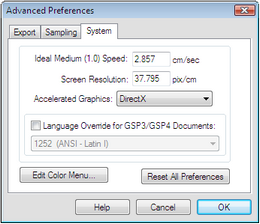 Graphics acceleration: (This option may not available on some older computers). 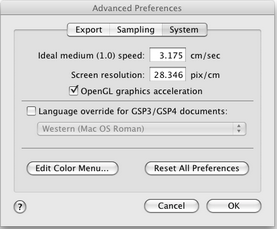 This setting determines the speed of the graphics displayed in your sketches. When it’s enabled, Sketchpads uses available graphics software and hardware to optimize the speed of drawing on the screen. If some objects are drawn incorrectly, try turning graphics acceleration off. If doing so eliminates the problem, first try to solve the problem by updating your computer’s graphics software and/or firmware. If that fails, leave graphics acceleration turned off. Language override for GSP3/GSP4 documents: If a Sketchpad 3 or Sketchpad 4 document was created in a different language, text may not appear correctly in Sketchpad 5, because older documents contain no information about the language in which they were created. (If Sketchpad is able to detect this situation, a dialog box appears describing the problem.) To preserve the original text when you open such a document, use this pop-up menu to set the appropriate language override. Remember to set it back to your normal language when you’re finished. Edit Color Menu: This button displays either the Macintosh Color Picker or the Windows Edit Color Menu dialog box. These dialog boxes allow you to change the colors in the Color menu. Use this feature to add your favorite shades of magenta, teal, or chartreuse. If you create a sketch with a dark or black background, you may want to add white to the Color menu. Reset All Preferences: This button allows you to reset all Sketchpad preferences to their original values. Use it with care: you’ll lose all the preferences values you’ve set in any other way.